Nobody wants to turn on the oven during the hot, humid, summer months. If you’re already paying for air conditioning, why would you want to add more heat to your house? You might as well do exactly what your mom told you not to do and leave the back door open to “let out all the cold air.” If you aren’t using your oven, though, how precisely do you cook meals? The microwave works, but that’s one-dimensional. You could order out every day and then eat cold pizza for breakfast, but your bank account probably won’t survive that. That leaves one, obvious option: the grill. The summer is the perfect time for grilled steaks, burgers, veggie burgers, chicken skewers, pork, veggies, and anything else you can throw on the grill. Now that you’ve settled on the food option that makes the most sense, what should you drink to wash it all down? Water is key so you don’t spend your summer feeling sick and dehydrated. But after you’ve had your fill of water, you should have a beer. You deserve it after grilling all that meat for your friends and family. 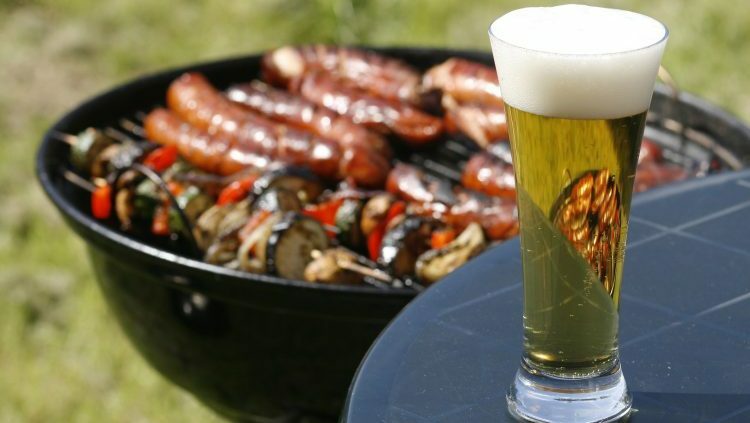 Not all beers are right for summer barbecues. You’ll probably want to stay away from stouts, porters, and strong ales. Can you imagine sitting in the sun and sipping a heavy, dark beer? That doesn’t sound very refreshing. There are great lighter beer options though. Check them out! Way before every craft brewery in the U.S. was making sour beers, Rodenbach was crafting Flanders Red Ale. In fact, the Belgian brewery has been making sour beers since 1821. Its newest offering, Fruitage, is more palatable for those who haven’t yet delved into the world of sour ales. It’s made up of 25% original Rodenbach (beer matured for two years in oak standing foeders). This is blended with 75% un-aged Rodenbach as well as cherries and elderberries. At 4.2%, it’s thirst-quenching, refreshing and perfectly paired with summer fare. This American hopped pilsner isn’t like the beer you’d expect to get from the Czech Republic or even most of the pilsners available in the US. This 5.5% easy-drinking Pilsner is available from April to July so you should probably stock up on it while you still can. Most Pilsners are made with Noble hops and Founder’s decided to Americanize its offering by adding Chinook, Cascade, and Centennial. This gives the beer a floral, citrusy brew that is beloved by pale ale, Pilsner, and IPA fans alike. With a name like Sunbather, you know this beer was made for summertime drinking. This is a truly unique summer beer. This sour pale ale is as hoppy as it is sour because of the dry hopping process. Plus, every batch they brew is made with a different single hop variety. That means if you buy some this week, it will be subtly different if you buy more next week. But no matter when you purchase this beer, it’s guaranteed to pair well with grilled foods and sunny days. The name of this 5.5% American pale ale is a reference to the idea that Lagunitas didn’t plan on joining the trend of canned beer. Once you’ve tried this crushable beer, you might not want to spend your summer (and the rest of the year) drinking anything else. It’s made with a blend of “old- and new-school hops” and is light and refreshing and feels like it was made for drinking on a hot day while grilling burgers and hot dogs. Learn more about the Best Beers here.